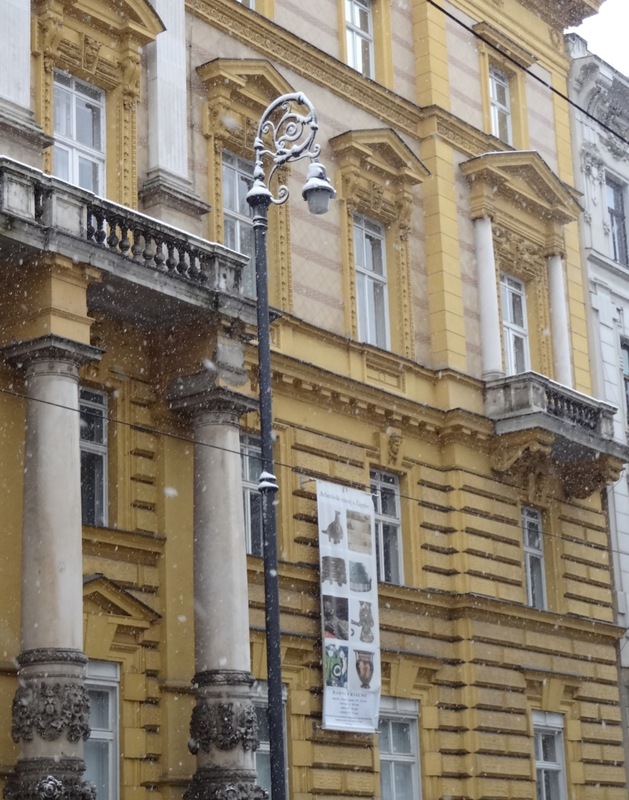 Snow and sleet did not deter 10 passionate blog writers and our “I’m used to this kind of weather” guide, Ivana, from taking to the streets of Zagreb. 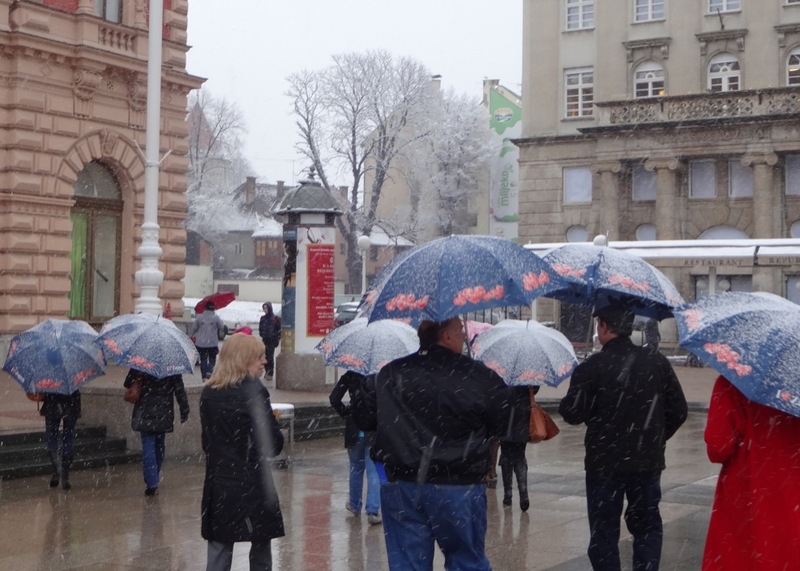 Armed with emblematic umbrellas courtesy of The Zagreb Tourist Board, our herd of North American writers ventured out of the warmth of the Esplanade hotel for a tour of the city. The snow falls gorgeous on the19th century trees that line Zrinjevac park. The park is the oldest in Zagreb. It is surrounded by architecture of the Baroque style and is reminiscent of the communist times when Croatia, Hungary, the Czech Republic were all part of the same regime. It was a time when the same architect did the same style everywhere. What you see more around Zagreb, however, is the color yellow, the Empress of the 18th Century’s favorite, and the cheapest color in the 19th century. Much of the city of Zagreb has been built and rebuilt over a tumultuous history that includes of course, invasions – it’s Europe! But a disastrous earthquake in 1880 crumbled much of the city including parts of the St. Mark’s Church. From the outside, whiter stone is contrast to older weathered stone. There is homage to the old stone wall of the 1500s with the two original spires of the church placed beside the wall in remembrance. Inside, the architecture is divided distinctly between the arches of the 16th century and those of the 20th. 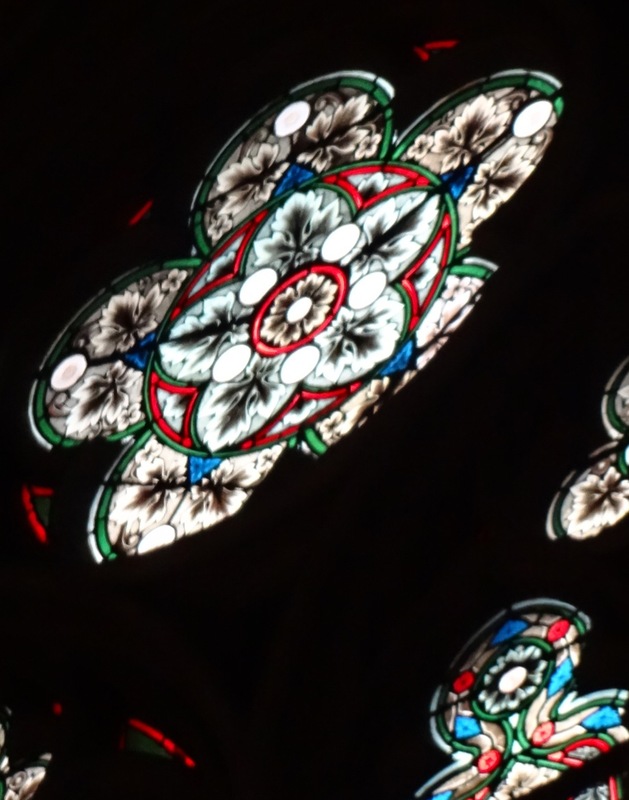 Remarkably, several pieces throughout the church withstood the effects of the earthquake, including the stained glass windows and organ pipes. 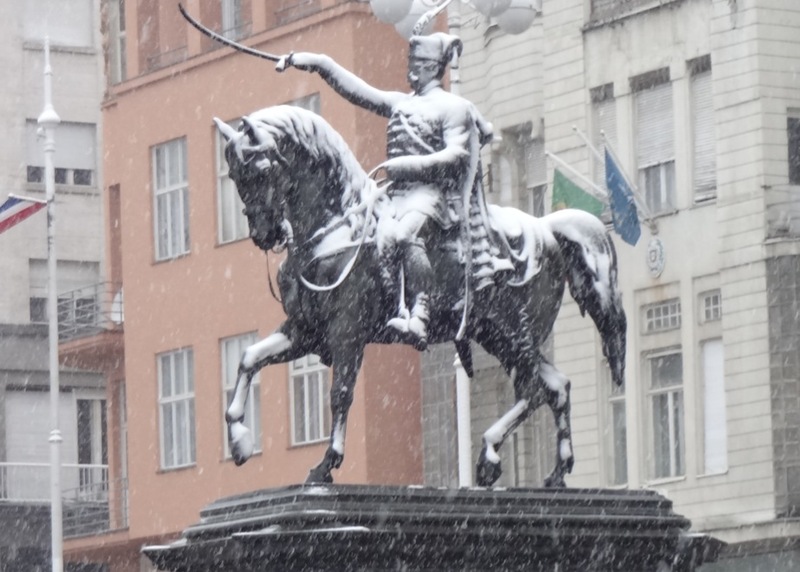 If ever lost in Zagreb or looking to meet up with someone head, “under the tail.” The statue of an 1848 General riding a horse with a sword is the only statue in Zagreb square. Over time, it has been relocated from the right to the left. It was hidden in a Professor’s basement until the Berlin wall fell, and it once pointed North toward Hungary. After WWII when Austria and Croatia fought and won against Hungary, it was rotated to point South. The heart-shaped ginger bread cookie that is the logo the Tourism Board uses for Zagreb, and adorns our umbrellas, is based on a tradition started in the 1600s. An artist gave his lady his heart-shaped cookie with a mirror in it, “so she could see herself in his heart.” These cookies remain a symbol of the people of Zagreb and a gift at Christmas to all who are loved. Ironically, this love-filled city is home to a unique love-themed museum. A ride on the funicular saves us a steep climb and at the top, the Museum of Broken Relationships. The premise of the museum is built on an emotion that is relatable across all ages, countries, and time boundaries. Started as a traveling exhibit, the well-received artifacts of love-lost are housed in a modern building in Upper Town. Items are donated from around the world, from men and women, and are submitted with their story. A cathartic exercise for those donating and a for those visiting, confirmation of what makes us all human.